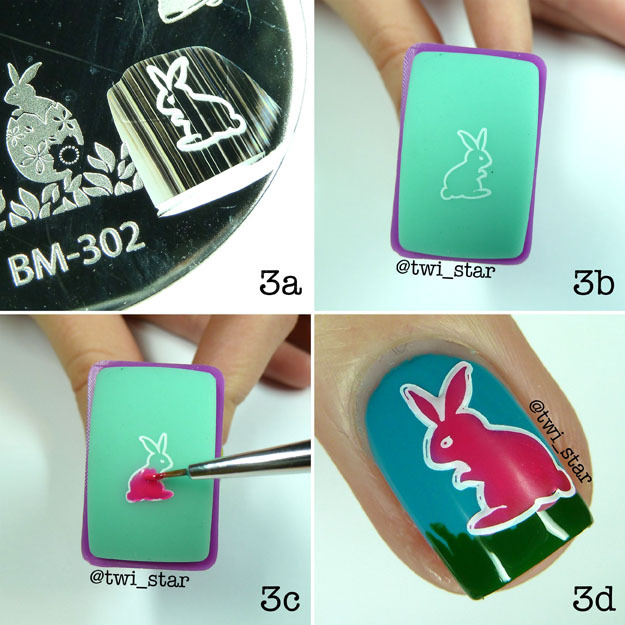 twi-star | Nail Art Blog: BUNDLE MONSTER Easter Nails Stamping Tutorial and Giveaway! BUNDLE MONSTER Easter Nails Stamping Tutorial and Giveaway! Are you ready for Easter? 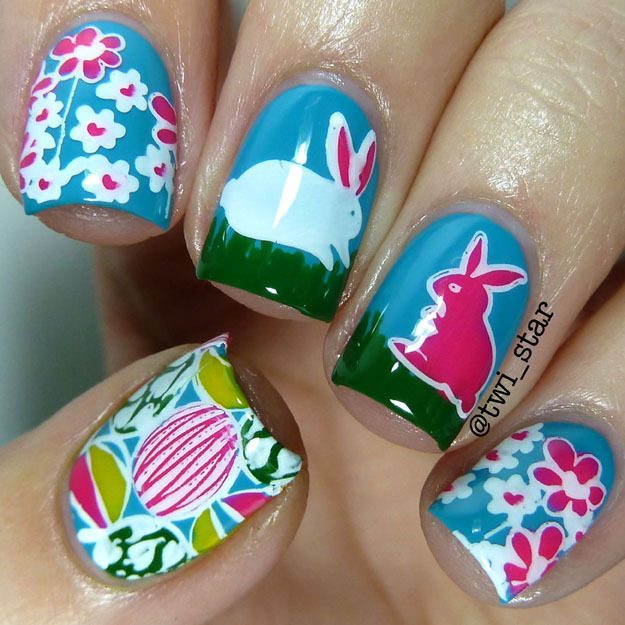 How about we get in the mood for bunnies and chocolate with some stamping! Today I am sharing a tutorial that I created for Bundle Monster using a couple of their Easter and Spring stamping plates BUT the best part is that Bundle Monster provided me doubles of all products used that I am giving away to all my followers! Yaaaaaayyyyy! The giveaway is at the end of this post, you will be able to enter here many different ways and you can also enter over on Instagram, check out my page: @twi_star and @bundlemonster for details. For this mani I used a technique called reverse stamping. Reverse stamping is when you leave the image stamped on your stamper and paint it in before applying to your nail. Sounds complicated right? Well guess what?! If you have stamping experience, it’s not! And I’ve laid out all the steps so you can recreate this mani with links to all the Bundle Monster polishes, stampers, and plates used. Shall we get started? Here are all the products you will need to complete the look, if you enter the giveaway at the end of this post you can win them all! All products used (except for base and top coat, and dotting tool or toothpick) are from Bundle Monster. Want to see the tutorial? Click below! Step 1 – Apply your base coat, once dry apply Bundle Monster Sky Blue Nail Stamping Lacquer to all nails as your base color. This polish is very pigmented so I only needed 1 coat for full opacity! Let dry, if you only needed 1 coat it should dry quickly. Step 2 – Take your wax paper or scrap paper and put a few spots of Bundle Monster Lucky Green Nail Stamping Lacquer onto it. On your middle and ring fingers, make a stripe along the free edge of your nail and then make little upward dashes for blades of grass. The nice part about this step is it’s ok if it’s not perfect! Let dry. Step 3 – The first nail we will stamp is the ring finger using plate BM-302. Apply a strip of Bundle Monster Angelic White Nail Stamping Lacquer white polish to the top of the bunny, scrape, and pick up image with stamper. Leave the stamp on the stamper and paint in the bunny using Bundle Monster Electric Pink Nail Stamping Lacquer. Try not to paint outside of the white lines so that the pink does not show outside of the image lines. Let dry, it does not need to be fully dry but maybe about 5 mins. Apply to nail like you normally stamp. Once on the nail the bunny should look like a decal and be fully painted in! Step 4 – We will do the same as above but using a different plate for the middle nail image. 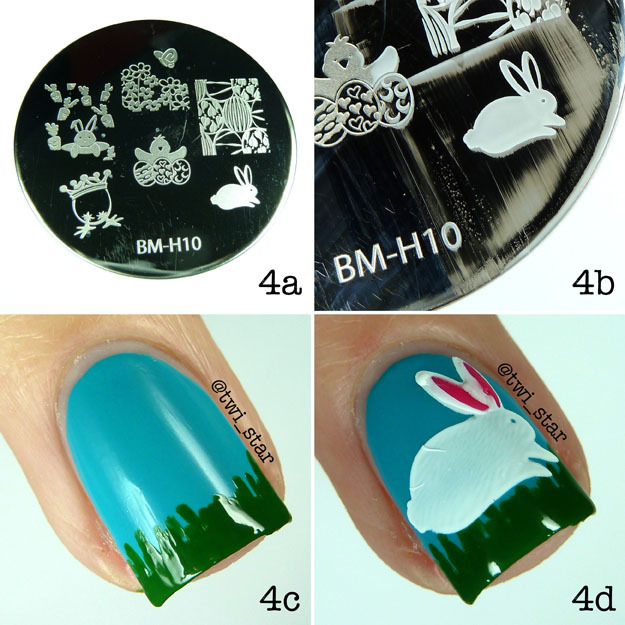 Using plate BM-H10 apply a strip of Bundle Monster Angelic White Nail Stamping Lacquer white polish to the top of the bunny, scrape, and pick up image with stamper. Leave the stamp on the stamper and paint in the bunny’s ears using Bundle Monster Electric Pink Nail Stamping Lacquer. Since it’s such a small portion of pink painted in, I didn’t show it. Let dry, it does not need to be fully dry but maybe about 5 mins. Apply to nail like you normally stamp. Step 5 – Using plate BM-302 apply a strip of Bundle Monster Angelic White Nail Stamping Lacquer white polish to the top of the flower image, scrape, and pick up image with stamper. Leave the stamp on the stamper and paint in the flowers using Bundle Monster Electric Pink Nail Stamping Lacquer. Let dry, it does not need to be fully dry but maybe about 5 mins. Apply to nail like you normally stamp. Repeat this step for the pinky nail. Step 6 – Using plate BM-H10 apply a strip of Bundle Monster Angelic White Nail Stamping Lacquer white polish to the top of Easter egg image, scrape, and pick up image with stamper. Leave the stamp on the stamper and paint in the eggs using Bundle Monster Electric Pink Nail Stamping Lacquer, Bundle Monster Lucky Green Nail Stamping Lacquer, and Bundle Monster Sunshine Yellow Nail Stamping Lacquer. Let dry, it does not need to be fully dry but maybe about 5 mins. Apply to nail like you normally stamp. Step 7 – Add top coat of your choice and let dry. You’re all done! Now onto the really good stuff! The GIVEAWAY!!! Here are all the Bundle Monster products that are included as the prize. This is everything you need to complete the tutorial above! Winner must provide valid email and shipping address within 24 hrs or a new winner will be selected. No drama! Please be nice and all rules are mandatory and if not followed you will be disqualified. I reserve the right to disqualify someone for causing drama or bullying. Giveaway closes April 18th, 12:00 am EST. I will do my best to announce the winner 24 hrs after the giveaway closes. Once the prize package leaves my hands I am not responsible if lost or damaged but I will do my best to track the package until it gets to the winner. Yes! I realized quickly that I didn't need to use top coat to make a decal. Like you said if I use a super glossy top coat and its fresh then the reverse stamping sticks to it. I will usually apply top coat and then paint the decal on the stamper and by the time the decal is dried on the stamper my top coat on the base color is dry enough but still tacky! Thank you!